Gary Slovin has accomplished a lot in his four decades as a lawyer, starting his career with a small firm in Philadelphia. Subsequently, Gary joined the largest and oldest law firm in the state of Hawaii in 1970. Early this year, he became a managing partner of Goodsill, Anderson, Quinn & Stifel, LLP. Gary specializes in government relations, including representation of clients before government agencies, negotiating agreements with regard to contested matters, and representing clients before the Hawaii State Legislature and the Honolulu City Council. Besides all the achievements in his professional career, it is still Gary’s involvement with the non-profit sector that makes all the difference in the community. Being a mayor’s wife and a career person herself, it seems that there is so much pressure on Gail Mukaihata Hannemann, but apparently she enjoys every moment of her waking life. Gail Hannemann spent more than 15 years in Washington D.C. as congressional aide and professional staff member of the U.S. House of Representatives prior to moving to Hawaii in 1992. Married to Honolulu mayor Mufi Hannemann, Gail currently serves as CEO of the Girl Scouts Council of Hawaii and an active member of various community organizations. When asked how it felt to be married to the mayor of Honolulu, Gail said that it made her life better in a sense that it became more organized yet stayed appealing. Their professional career, according to Gail, makes for an interesting conversation during the end of the day, which puts their relationship on even stronger ground despite their busy schedules. On October 6, 2006 Kari and Evan Leong were featured on PBN Friday with Howard Dicus on PBS Hawaii. Here is the video for your viewing pleasure. Check out the most recent trailer for Greater Good TV which debuts on KGMB9/CBS on January 6, 2007. The show will air on Saturdays and Sundays at 4:30 PM leading into the 5 PM news. This was made from short clips filmed in the radio studio. GGTV is currently being filmed in the KGMB9 television studio. Susan Page embodies everything that characterizes today’s powerful career women. As a profession, Susan has become a model, fashion-oriented entrepreneur, emcee, radio show host, public speaker, and writer. But despite all her conquests and successes as a career person, Susan still considers her involvement in the family and raising children as the greatest achievement of her life. On the other side that tips the scale lies Susan’s commitment to the community. Susan has co-hosted the Kapiolani Children’s Miracle Network telethon and specials for 22 years and currently serves as a director on the boards of the Kapiolani Health Foundation, Women In Need, and is Vice Chair of the national board of the humanitarian faith-based organization, Heart for Africa. Her involvement with the latter made her realize how minute and irrelevant her problems were relative to those she came across with in Africa. Retired Navy Captain Jerry Coffee has spent 7 years and 9 days as a prisoner of war in North Vietnam, mostly in solitary confinement. Captain Coffee, along with his comrades, endured physical and psychological torture, not to mention the agony of being away from home and loved ones. To this day, his experience serves as an inspiration to thousands, or even millions, around the world—his story withstanding the test of time. Capt. Coffee considered those years under communist incarceration an episode that should be heard, and this became his purpose. Retiring from the military, Capt. Coffee started a civilian career as a professional speaker and author, sharing his stories to thousands of people across America and overseas. 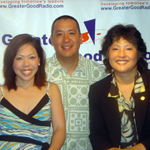 HONOLULU – In the year since Greater Good Radio hit the airwaves on AM radio 1420, hosts Evan and Kari Leong have recorded interviews with 121 of Hawaii’s top business and community leaders, mentoring thousands of listeners with innovative ideas and business insights – free of charge. To celebrate a year of success, offer a preview of what is next for Greater Good Media and to honor the invaluable gift that each of the Greater Good Radio guests have contributed to the next generation of Hawaii’s business leaders, Greater Good Radio will hold an anniversary party at Pearl on Friday, September 29. 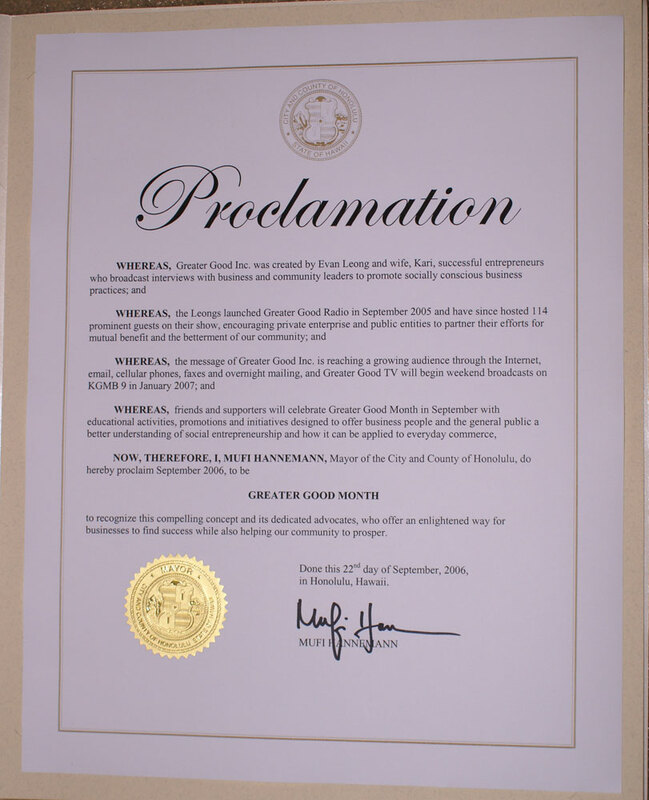 On September 22, 2006 Mufi Hannemann, Mayor of the City and County of Honolulu signed a proclamation for September 2006 to be the GREATER GOOD MONTH. This milestone marks yet another validation of the mission of Greater Good Inc and Greater Good Radio and TV. to recognize this compelling concept and its dedicated advocates, who offer an enlightened way for businesses to find success while also helping our community to prosper. GREATER GOOD Radio is one year old and celebrated its birthday at the new Pearl nightclub on Friday. Mayor Mufi Hannemann was traveling, but his proclamation declaring September 2006 Greater Good month was presented. 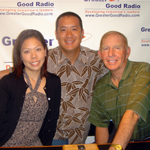 Greater Good Radio first hit the air on KKEA-AM 1420 Sept. 3 of last year because of a conversation between a pole-vaulting coach and local businessman Duane Kurisu, who is also a minority investor in the Honolulu Star-Bulletin. The show has featured interviews of more than 120 business leaders from Hawaii and elsewhere, with the goals of inspiring a new generation of leaders and of conveying the importance of serving the community, not as an aside, but as part of the business plan.